Although we saw quite a few baboons, and some spotted colobus monkeys, we did not see any chimps on the way. 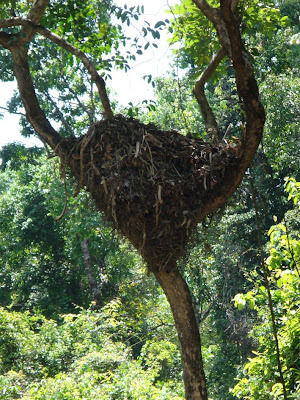 However, we did walk past several chimps' nests, such as this one. Each night, chimps make a new nest and leave it the next day. The species of chimpanzee in Gashaka Gumti are unusual in their use of tools - bee and ant sticks etc.